Rotary Evaporator 50L Senco Senco Rotary Evaporator with high Vacuum rate. Our Best performing Rotary Evaporator have big condensing surface Area for efficient distillation. The double loop condenser coil of the rotary evaporator gives higher condensation and receiving rates. Highest Quality perfectly engineered PTFE seal assembly of the rotary evaporator gives extended high life. Simple electronic contorl panel of Senco rotavapor requires lesser maintenance. Strong boro silicate glass parts are used in our rotary evapotor. PT-100 temperature sensor of our rotary evaporator gives high precision temperature control. Ac-Induction motor of our Rotary evaporator is noiseless and maintenance free. Specifications Rotary Evaporator 50L, Water/Oil Bath; - With Patent non-stop tandem receiving tech; - With complete flange joint, no glass SENCO is a among first brands in China, if featured as "Safe. Durable. Efficient", and serves middle and high-end users mainly. Features: - High vacuum performance; - Bath Lifting; - Rich function, friendly operation experience, easy assembly structure; - Popular model among Senco rotary evaporators. 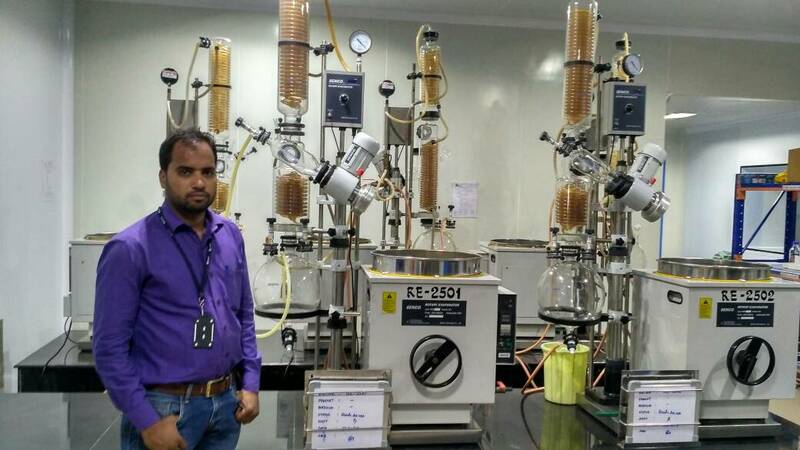 Rotavapor in Hyderabad senco Rotary Evaporator 10 Litre Senco Rotary Evaporator with high Vacuum rate. Our Best performing Rotary Evaporator have big condensing surface Area for efficient distillation. The double loop condenser coil of the rotary evaporator gives higher condensation and receiving rates. Highest Quality perfectly engineered PTFE seal assembly of the rotary evaporator gives extended high life. Simple electronic control panel of Senco rotavapor requires lesser maintenance. Strong boro silicate glass parts are used in our rotary evaporator. PT-100 temperature sensor of our rotary evaporator gives high precision temperature control. Ac-Induction motor of our Rotary evaporator is noiseless and maintenance free. laboratory chillers manufacturers in Hyderabad chillers manufacturers in Hyderabad Recirculating chiller for rotary evaporator KD TRADERS introduces chillers for rotavapor in Hyderabad. We are sourcing the chillers for the purpose to keep chillers cools in the heaters. We are focused design the innovative ideas and design with suitable adjustable mechanical devices.The chillers are the mechanism which is used to remove heat from a liquid via a vapor-compression. we customize Chillers according to the END USER For MULTI ROTAVAPOR USE , This products are majorly used in the laboratories, scientific research, etc. Brand name KD CHILLERS for rotary evaporator or Rotavapor Indigenous developed high Performance Cooling circulatory for Rotary Evaporators have big cooling capacity and are compatible with Senco Rotavapors. recirculating chiller for rotary evaporator chiller for rotary evaporator And we are Chillers Manufacturers, Suppliers & Wholesalers in hyderabad chiller for rotavapor chiller for rotavapor in hyderabad Multi functional Chiller for Rotavapor and we customized according to end user chillers for rotavapor in hyderabad by kd traders TECHNICAL SPECIFICATIONS Features KDC05 Medium Temperature Range -5℃~20℃ Temperature Stability ±1°C Cooling Capacity 500Watts @ 0C Pump flow max 8l/min Bath Volume 5L Mobility Heavy duty castor wheels MOC Outer body powder coated Crc & S.S 304 inner Refrigeration CFC Free Emmersion Dimensions (cm) 30x50x53H Supply voltage 230VAC; 50Hz (5A) KD TRADERS introduces chillers for rotavapor or Rotary Evaporator. We are sourcing the chillers for the purpose to keep chillers cools in the heaters. We are focused design the innovative ideas and design with suitable adjustable mechanical devices.The chillers are the mechanism which is used to remove heat from a liquid via a vapor-compression. we customize Chillers according to the END USER For MULTI ROTAVAPOR USE , TOR This products are majorly used in the laboratories, scientific research, etc. How to Use Rotary Evaporator or Rotavapor General rules for usage of rotary evaporators 1. The solvent collection flask of the unit should always be emptied prior use to prevent accidentally mixing of incompatible chemicals. SAFETY FIRST! 2. The flask with the solution is placed on the rotary evaporator. The use of a bump trap prevents the solution from accidentally splashing into the condenser (and being contaminated). It is highly advisable to start with a clean bump bulb in case something bumps over after all! This would allow the experimenter to recover the solution or solid. 3. A metal or Keck clip is used to secure the flask and the bump trap. The green one shown below fits 24/40 ground glass joints. Similar blue clips fit 19/22 joints and the yellow ones fit 14/20 joints, which will most likely used in the lab. If you break the bump trap, you will have to pay for it! 4. The dial on the motor is used for speed control of the flask rotation. A typical rotavap uses a variable speed sparkless induction motor that spins at 0-220 rpm and provides high constant torque. A good setting here is 7-8. 5. The aspirator vacuum is turned on. On most models, the vacuum on/off control is managed by turning a stopcock at the top of the condenser (left side of the above diagram). This stopcock is later also used to vent the setup after the solvent is removed. 6. The flask is lowered into the water bath (or the water bath is raised to immerse the flask in the warm water. (On most models, a convenient handle (with height locking mechanism) moves the entire condenser/motor/flask assembly up and down. Often the tilt of the condenser assembly can also be adjusted. The water bath temperature should not exceed the boiling point of the solvent!! For small amounts of common solvents the bath heater is not needed. 7. The solvent should start collecting on the condenser and drip into the receiving flask. Some solvents (such as diethyl ether or dichloromethane) are so volatile that they will also evaporate from the receiving flask and be discharged down the drain. To prevent this, a cooling bath on the receiver or (on some models) use a dry-ice condenser can be used. In addition, an additional trap (with dry-ice or liquid nitrogen) can be placed between the vacuum source and the condenser unit. This is particularly important of a membrane pump is used as vacuum source. 8. Once all the solvent evaporated (or whatever is desired at this point), the vacuum is released, . The flask is raised out of the water bath and the spinning is discontinued. 9. The bump trap has to be cleaned and the receiving flask is emptied upon completion of the evaporation. Tips and Tricks Tips and Tricks Distilled water should be used in the heating bath to minimize the scale build up in the bath which coats the theoris and heating coils. It is very difficult to remove and reduces the efficiency of the bath. In addition, regular tap water will promote the growth of spectacularly disgusting algae colonies, particularly during the summer months. The best protocol is a regular exchange of the water. To remove algae gunk from the inside of a coiled water condenser, the condenser has to be removed from the rotavap and the coil is soaked in a dilute nitric acid solution for a few hours. After carefully rinsing the insides, the rotavapor is reassembled. All standard safety precautions should be followed when working with nitric acid! The ground glass joint holding the flask does not need to be greased, but on rare occasions it (or the bump bulb) may get "frozen". Some companies sell special joint clips that can free frozen joints simply by screwing them in one direction. If you are not lucky enough to have these and cannot release the joint you probably want to ask your teaching assistant for advice. If a mechanical pump is used instead of an aspirator to produce a vacuum, a secondary trap has to be used to prevent that the solvent destroys the membrane or is absorbed in the oil.